After homing load a tool with "TnM6" where "n" is the tool number. Move tool to an extablished point using a gauge or take a test cut and measure. Select "Tool Table" in the Coordinate System drop down box. The Tool Table will be changed with the correct Z length to make the DRO display the correct Z position and a G43 command will be issued so the new tool Z length will be in effect. 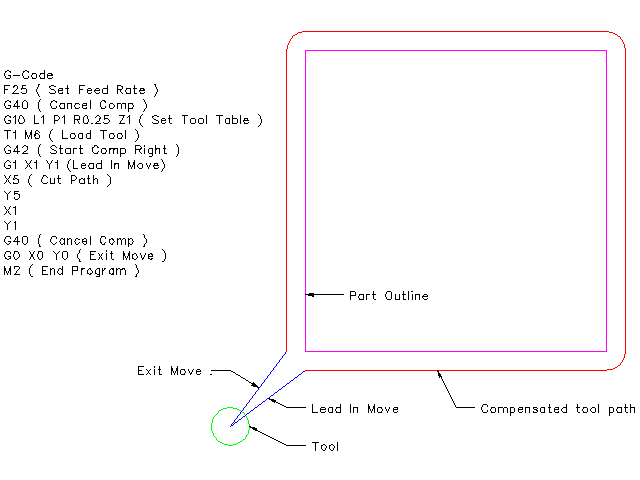 Tool table touch off is only available when a tool is loaded with "TnM6". By using "G10 L1 Pn Zx" where "n" is the tool number and "x" is the offset from the MDI window or in your program you can also set the tool table. The "Tool Table" is a text file that contains information about each tool. The file is located in the same directory as your configuration and is called "tool.tbl". The tools might be in a tool changer or just changed manually. The file can be edited with a text editor or be updated using G10 L1. See the Lathe Specifics Section for lathe tool table example. The maximum number of entries in the tool table is 56. The maximum tool and pocket number is 99999. EMC supports three types of tool changers "manual", "random location" and "fixed location". Information about configuring an EMC tool changer is in the Integrators Manual. Fixed location tool changers like lathe turrets the tools are in a fixed position in the tool changer. When EMC is configured for a fixed location tool changer the "P" number is ignored (but read, preserved and rewritten) by EMC, so you can use P for any bookkeeping number you want. Random location tool changers swaps the tool in the spindle with the one in the changer. This type of tool changer the tool location will always be in a different pocket after a tool change. When a tool is changed EMC rewrites the pocket number to keep track of where the tool are. T can be any number but P must be a number that makes sense for the machine. 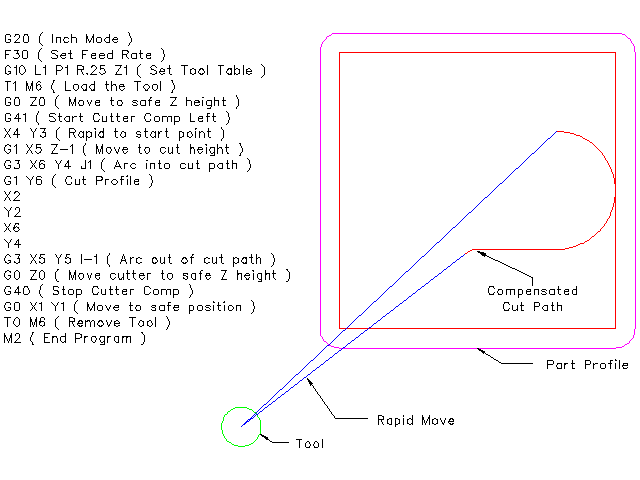 Cutter Radius Compensation allows the programmer to program the tool path without knowing the exact tool diameter. The only caveat is the programmer must program the lead in move to be at least as long as the largest tool radius that might be used. 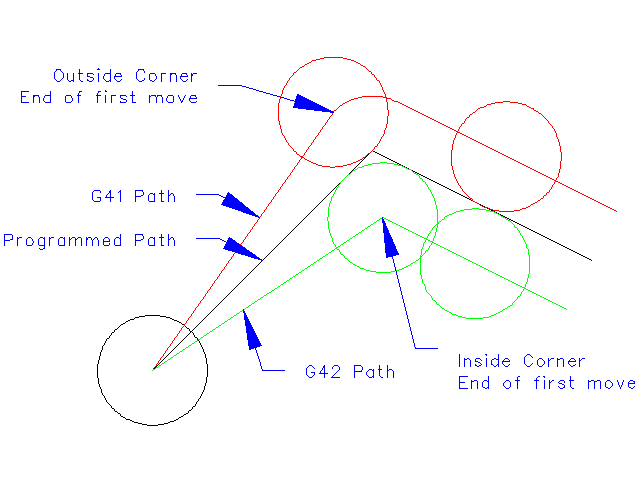 There are two possible paths the cutter can take while cutter radius compensation is on to the left or right side of a line when facing the direction of cutter motion from behind the cutter. To visualize this imagine you were standing on the part walking behind the tool as it progresses across the part. G41 is your left side of the line and G42 is the right side of the line. 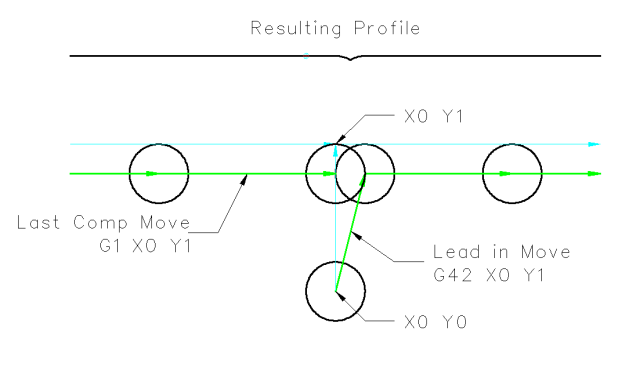 Cutter radius compensation uses the data from the tool table to determine the offset needed. The data can be set at run time with G10 L1. Any move that is long enough to perform the compensation will work as the entry move. The minimum lenght is the cutter radius. This can be a rapid move above the work piece. If several rapid moves are issued after a G41/42 only the last one will move the tool to the compensated position.